Benefits include streamlined day-to-day job costing and P/L control, greater visibility into change orders and certified payroll, easy generation of WIP reports for bank and bonding needs and improved cash flow. For this grading company, managing nearly $3.5M of work each year using generic accounting software was proving to be a challenge. 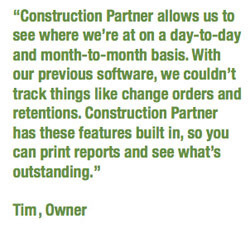 The Illinois-based excavation contractor used spreadsheets to track day-to-day job costs, manage change orders and create documents like Certified Payroll reports and G702/G703 billings. But entering data multiple times and in multiple places was taking its toll on Midwest’s lean office staff. And with its busy season just around the corner, Owner Tim P. and Accounting Manager Georgiann C. decided it was time for a change. Our paper trail was in all different areas rather than in one system,” says Tim. “This made it very time consuming to create reports for Tim and difficult to actually find the information he wanted,” adds Georgiann. So the two set out to find new accounting software that would handle the complex needs of a union contracting firm and eliminate the spreadsheets. Tim and Georgiann used Internet research to create a software evaluation shortlist and quickly moved to the demo phase of their search. In addition to construction-specific functionality, ease-of-use was a top priority; they didn’t have the resources to deal with a long learning curve. Their grading company purchased Construction Partner. And, with just a few short months until business would be booming, Tim and Georgiann were counting on a swift conversion. To expedite setup, they sent Construction Partner its union, payroll, vendor and customer data, which was converted and loaded onto the software before training began. 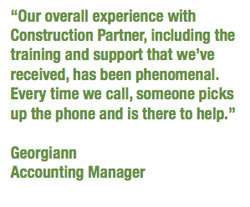 After just two days of on-site training, Georgiann was comfortable with the basics of Construction Partner, including the core accounting modules, Job Costing and Equipment Management. Subsequent phone training added to her knowledge of the software and addressed questions as they came up. “Every time I had a question, I would call Construction Partner and they would walk me through the answer so I could quickly move on,” she says. The most complex conversion task was getting the Payroll module configured to accurately calculate the various union rates, dues and taxes. Although their grading company out-sources payroll processing, Georgiann would be creating the Certified Payroll reports in-house and needed to ensure accuracy. In addition, labor costs are an essential element of job costing and equipment management. So even though paychecks weren’t being printed with Construction Partner, the data needed to be right.